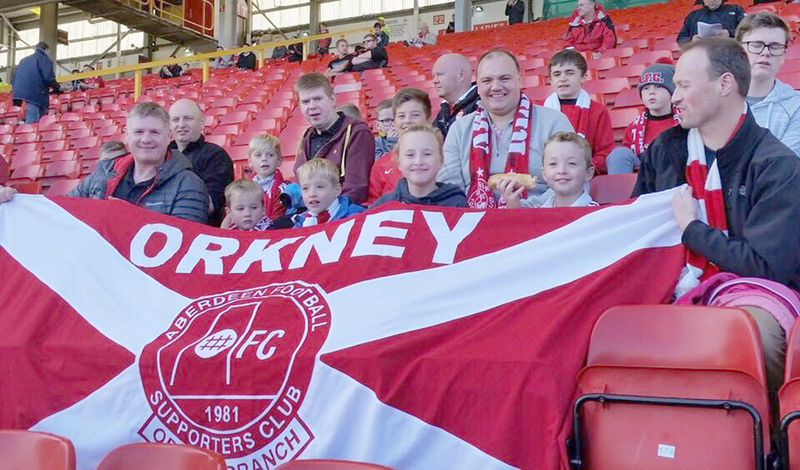 A specially arranged Junior Trip travelled down to see the Aberdeen v ICT game on Saturday 10th September, with a grand total of 16 travelling – 9 kids accompanied by 7 adults. This was certainly a long awaited ‘Junior Trip’…and what a fantastic weekend it was. Adorned in red & white colours which was great to see, excitement amongst the juniors was running high as we set off on the Friday night Northlink Ferry. After a comfortable overnight sailing, we arrived to a sunny day in the Granite City…and what start to the morning we had. Thanks to Angela & Scott at Pittodrie, the junior group were highly privileged to be given a stadium tour, prior to the match. This was an amazing experience for them, going into the dressing room, being pitch side, sitting in the media room, and seeing the history of this fantastic building. Plus meeting some of the players for autographs and photos…was just the icing on the cake. The juniors then had a great view of the game in the South Stand and although the game ended in 1-1 draw, I am confident that the overall experience will ensure our juniors will remain Dons fans for life. Sunday was a little more relaxing, we spent quite some time at Codona’s playing ten-pin bowling, then the amusement park (well it is a junior trip after all!). Then it was time to leave, off to the Northlink boat we went. But the trip wasn’t over yet and what a perfect way to round it off, Sandy Cooper specially arranged for the juniors to go up to the bridge and meet the Captain, see the ferry’s control centre…and what a view!, it truly was a fantastic experience. Maybe not sure but … I think the adults liked this part too. Although the juniors would have been tired for school on the Monday morning, it was clear from all, that the Junior Dons Trip was a huge success. Funds permitting we are intending that this could become an annual event, as our Junior Dons are the future of our Supporters Club.